Following on from my previous blog about our 3rd Lync Event we have recently published more information which i would like to share with you. Firstly we have added another session onto the agenda to talk through what the recent announcement from Microsoft (Skype For Business) means to companies already using Lync or are thinking of moving onto Lync?. Arguably the Skype for Business announcement is one of the biggest announcements of the year, the Skype for Business news is causing much discussion and has divided opinion in some camps. Join us on the 2nd December to hear more about the news and get an insight as to what it could mean for you. And finally to finish this blog, we are also pleased to announce that we will have a number of industry leading vendors join the event as part of the showcase being held over lunch, representing many of the associated aspects of a UC solution, from hardware infrastructure and connectivity, to devices and applications. As mentioned at the start of the blog we have limited places left! so Register today! NorthernUC – Rebranding is now complete. The same blog site with the same content going forward, but dropping the ‘Lync’ element of the name for a more generic UC naming handle following the Skype for Business announcement. We’ Modality Systems are holding our third annual Lync event which builds on the success we had last year. This year we have changed locations but are keeping with the car theme and are hosting our event at the Millbrook Technology Park in Bedfordshire on Tuesday 2nd December. The theme to our event is around how to keep ahead of the curve in unified Communications, with selected speakers from some of the Modality Systems customers, plus out own in-house experts. We are limited to 100 seats, so if you would like to attend and listen about to the journey of UC then select the below race track image were you will be hyperlinked to the registration page. I’ve been waiting to complete this blog post for a while. And hopefully it will be an insight to the four different speakerphones available on the market at this moment for Lync 2010/2013 and Lync for Mac. 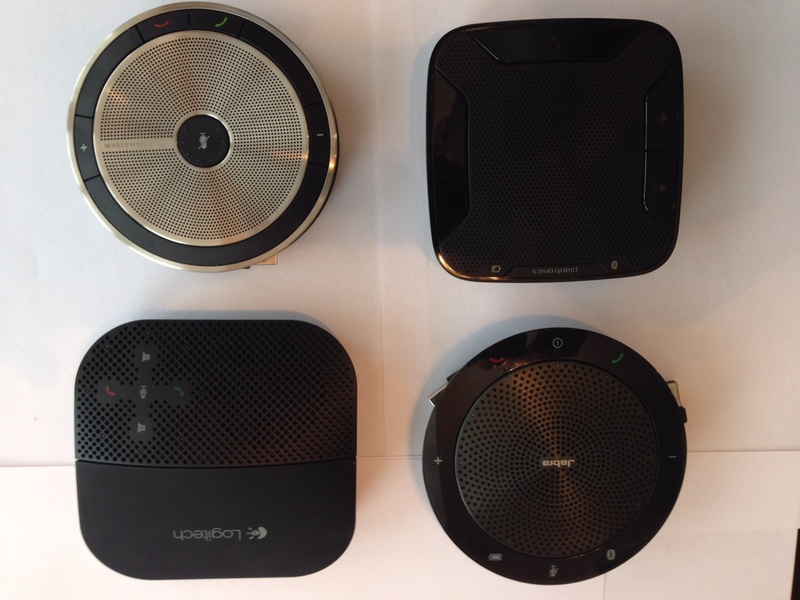 All the vendors have a history of Lync audio devices and some have been selling the optimised speakerphones for a while and a couple of the others have only just entered the market with their respective device. In this review we will look at a number of different scenarios and benchmark each of the devices against each other in a number of real life tests. Its probably worth noting that the tests are none scientific and will be carried out in a normal working environment ie: no sound labs, or noise cancelling walls or booths etc.. These tests are carried out in my open home office. Note: To the vendors these opinions are my own and not some that maybe my company shares, also if I have missed a feature from your device please don’t take it as I’m biased towards another vendor. I’ve read each of your websites on the device and have a list of features and limitations. Anyhow, onto the tests and feature sets/scenarios which we will be using. Before we start on the tests lets quickly speak about each of the offerings available. The speak 510+ comes in a neoprene case which keeps the device snug and away from ‘bag clatter’ as you carry it around. Like the older version the speak 410 the 510 and 510+ is an identical device however the 510+ comes with its own Bluetooth dongle for better Bluetooth connectivity. The downside to getting the speak 510+ with its Bluetooth dongle is the fact the little dongle wasn’t catered for as part of the original design process for the speaker and therefore unlike the other vendor speaker devices available, there isn’t away where to store it. For me I just place it in the same neoprene case as the speaker and on a couple of occasions on opening the case the little dongle has dropped out onto the floor. For me this is only a matter of time before its lost somewhere. That said as a device and once set up I do like this speaker. 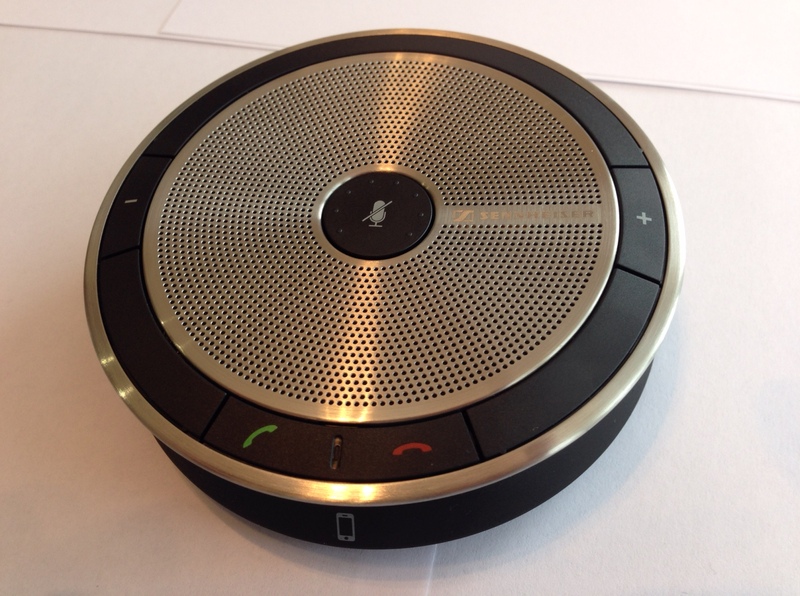 With regards to a quickfire connection, in a scenario where you might want a adhoc conference the speak 510+ is a very adapt device to quickly connect at the drop of a hat. The usb cable is picked up within an instant on Lync and a call can quickly take place. If you are to use the bluetooth element of the device then once you’ve found it and picked up the little dongle off the floor and plugged it in, the connection is relativity quick with no requirement for drivers etc (within 10 seconds). In all the tests carried out, the sound and speech were clear from 10 ft away (My benchmark distance) and the decibel reading was averaging around 74 decibels on normal talking, which was more than acceptable for use as a mini conference device. Playing music through the speakerphone is something that it wasn’t really intended to test if I was honest, but as I have seen other real life users using these type of devices in this way I thought it would be good to a least get a rating on the sound readings. Playing music through the speaker the sound max’d at 79 decibels which again from 10 foot away, audibly the sounded was clear but quite mono and ‘tinny’ <no bass>. I wouldn’t really suggest you purchase a speak 510 for music playing only, as there are better devices available to for fill this requirement. 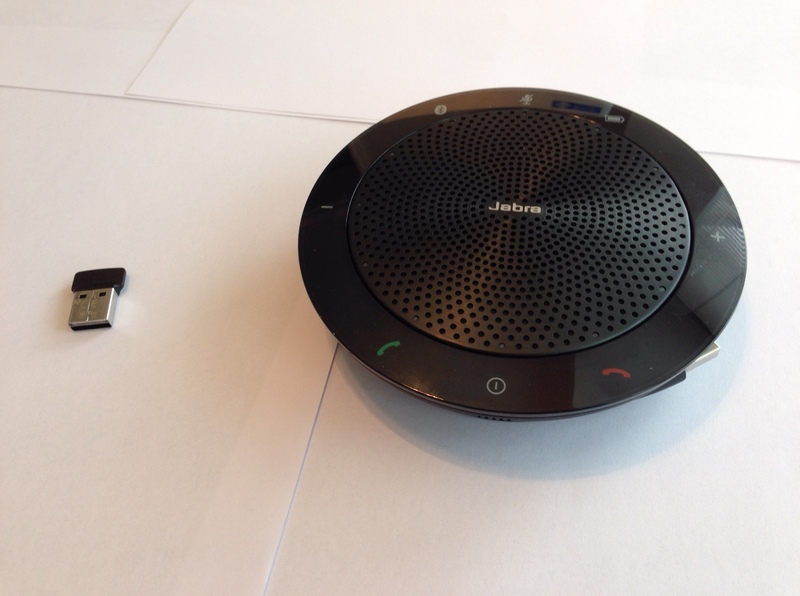 Jabra have put a couple of tech items into the device, but nothing, which is earth shatteringly new tech. With what seems to be the standard now, it comes with a wired USB connection measuring 1 metre in length and Bluetooth capability via a Bluetooth dongle PLUS also the ability to tether your mobile/cell phone for mobile conference calling. Additional Bluetooth headsets can also be paired to the speaker for a more private adhoc call. Unfortunately I believe these can only be Jabra Bluetooth headsets. Lastly if required you could also plug jack headphones into the speaker to mute the speaker and remain connected on headphones instead. ***Note: Jabra state that the Bluetooth range is around 100m with class 1 bluetooth and 10m with class 2. Using the Speak 510 with the provided Bluetooth dongle, I can only get 39 metres in a line of sight from my laptop. The battery life for me is one of the major plus points of the device with a average talk and listen time of 9 hours. Talk time of 11 hours and lastly a listen of 12 hours. The Speak 510 scored very high in this test. The Jabra speak 510+ has been available for a number of years with different variants and versions along the way dating back to the first one to hit the market the Speak 410. As for the design and look and feel, it’s a nice device and is one I carry with me as part of my kit bag. The ease of use is good and the sound quality is one of the best available on the market. I will continue to carry this device and recommend it to my customers. RRP – £149.00 but with good ‘googling’ you can get these retail sub £100 now. The Calisto sports a square shaped appearance unlike the Jabra and the Sennheiser’s rounded devices and is formed of a more matt looking hardened plastic. Again included with the P620 is a micro usb dongle, which fits snuggly into the bottom of the device for safekeeping. Quick-Fire using the device is ok, but there are omissions in my opinion, the first one is the lack of physical cable attached. Yes I know that a cable does come with the device and yes it can act as a physical USB connection if required. However I have the P620 and have no idea where my cable is? The second omission is the fact that the device will only pair with the micro usb? Meaning that if you loose it your stuffed until Plantronics sends you another one to pair with. I can absolutely see the logic in what Plantronics have done with the ‘no cable’ approach but for me it doesn’t work, and while ive been testing the device there were a couple of times when I left the device powered and plugged in and came back to it with a flat battery at which point I had to hunt again for the cable. The sound readings from the P620 are a mixed bag to be honest, the decibel readings were slightly higher than the Jabra at an average of 83 decibels, whereas the sound quality was lacking. If im honest I was slightly disappointed on how mono the device sounded, almost a echo type of voice translation. The mic output was loud and clear but similar to the speakers sound quality, the voice sounded very mono and echoing even though I was in an enclosed room. The volume levels from the mic input were good and averaging slightly higher than the Jabra at 52 decibels. Must say though all in all, for the sound and mic tests I wasn’t overly impressed. Nothing to exciting to write home about on the technology front. As standard we have the Bluetooth connectivity, and also the ability for you to pair your mobile/cell to the speaker. Also the P620 has the option to utilise the Plantronics software application ‘Spokes’, download here. Spokes allows you to automatically change your Lync presence status even when you might be on a call on your mobile connected and paired with a Plantronics legend or the Calisto 620. Your status would say ‘in a call’. If you don’t purchase a P620, if you have a Plantronics Legend bluethooth ear headset then it’s still worth the download of the spokes software. The battery life on the P620 was the second lowest in the 4 device test only beating the Logitech P710 by 37 minutes in battery life. On the tests carried out the device lasted 9 ½ hours on average on fulltime usage. As a company I like Plantronics and what they are trying to do in the Lync estate across all the Lync devices they offer. That said I don’t think the Calisto P620 cuts the mustard in what I would like it to offer. For me it lacked quality in the sound area, the battery life wasn’t the best and the detachable usb cable ‘feature’ for me is a pain. That said I think the build quality is good. 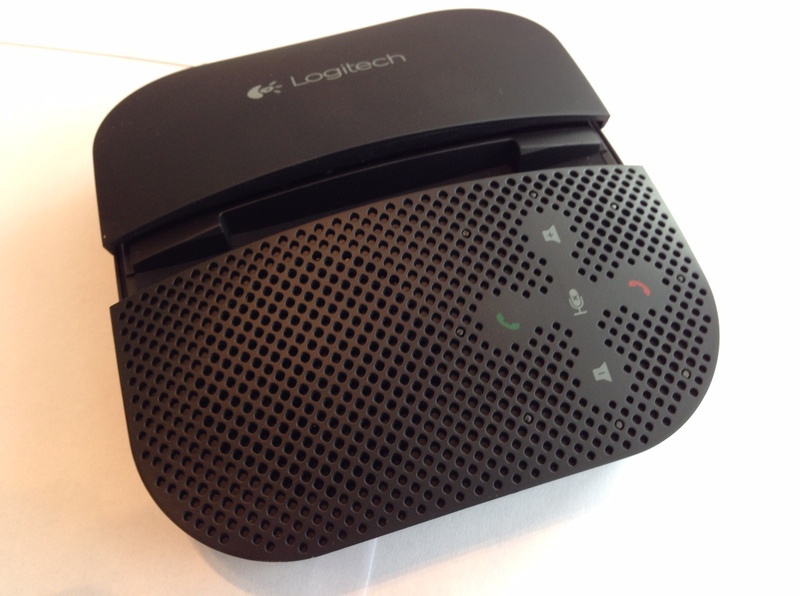 The Logitech P710 is another square shaped device and which hasn’t been on the market for to long, plus it is also the first from Logitech in the Lync speakerphone market. As usual it comes complete with the now standard neoprene case, but unlike the Jabra and the Plantronics device doesn’t come with a Bluetooth dongle. The fixed usb cable is coiled underneath the device and sits smartly on the desk. Also the device also has a kind of built in stand, which allows for the ‘docking’ without the electrical dock feature to sit devices on top of the p710 giving a viewing angle. On speaking to Logitech this stand is tailored towards the Apple type of iPad device for viewing. Using the device as a quickfire device is straight forward using the usb cable, which the Lync client picked up the connection in an instant with no driver install. As for the Bluetooth connection and the P710 not having a micro Bluetooth dongle, the device relies on the Bluetooth stack of the laptop/desktop for connectivity, due to this on the couple of machines I tested on there was a considerable delay/sometimes minutes before the device became active. Once the machine knew of the device it would connect a lot quicker thereafter. The P710 scored the lowest of all the devices in the sound stakes as the volume isn’t overly loud even when sat a couple of feet away. On the decibel reading from 10ft away I was seeing only 54 decibels readings on sound output and due to this low reading listening to someone speak really did take some concentration, to the point where you wasn’t listening to what content was being said but more on what word was being spoken. Keep in mind with what ive just mentioned on the low sound from the P710, using the mic was equally as poor noise quality and talking from 10 foot away produced a decibel reading of 38. The device simply could cope with the distance I was testing at. If however you wanted a device that the sound quality was good and you was always planning to sit close, the Logitech P710 could be something you might look at. Logitech has gone down the road of more is better’ ‘pack the tech’ into the device approach which has its plus and minus points. 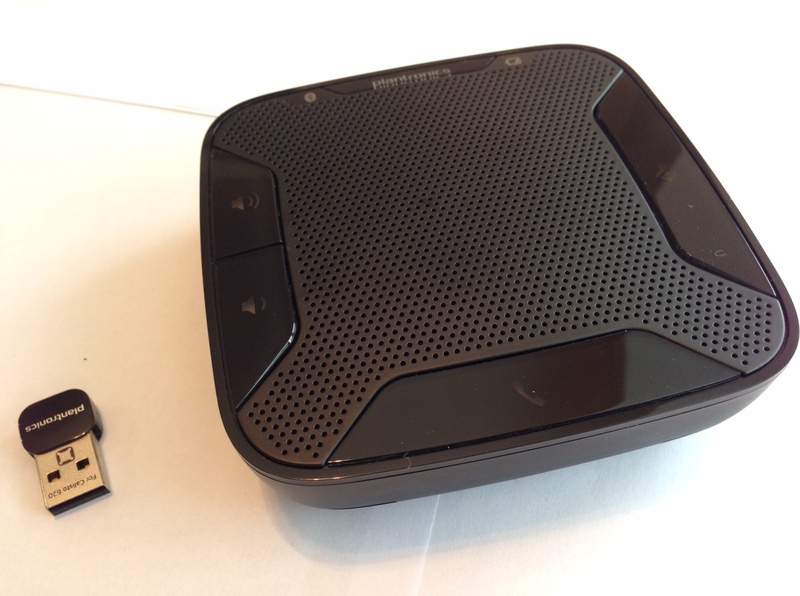 For instance one of the features Logitech boosts about is the ability to utilise the NFC (Near Frequency Communication) bus for connectivity. NFC was one of them flash in the pan bits of tech which no ones ever uses. 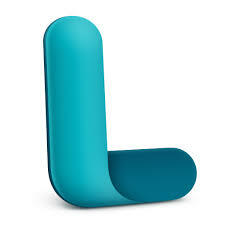 I do hope Logitech didnt spend a lot of money on R&D on the NFC feature in the device as its pointless. Next is the sliding docking? I have no idea why that was deemed a good idea by the product group, and in all the testing both in the lab and onsite have I every thought about docking my mobile device on top of it. Again for me its another pointless feature, unless the market is for a consumer device as i could see this as a nice feature. Having the Bluetooth feature is great, but we all know how notoriously bad the Bluetooth stack is on some laptops, and at best I would only really trust it with using with a Bluetooth mouse NOT voice ! Other tech features include stereo music playback ability and ‘enterprise’ voice quality sound. Logitech literature states ‘upto’ 15 hours of talk time from a full charge. On three attempts I could only squeeze just short of 10 ½ hours from the device. Interestingly I once blogged about another Logitech device for Lync, and while im writing this review, that same scenario and thoughts are echoing in my mind. Like the other device review I cant help but think that again Logitech has over engineered the P710 device to the point where some features are pointless. Also to the fact that its had a determent on the quality of some of the main key areas within the device. For example the sound quality is good, but the sound and mic simply aren’t up to the task of what a mini speaker should do. Both are quiet and poor. Also having no usb dongle and relying on the laptops Bluetooth stack is wrong and I know in many companies (Public sector), these devices wouldn’t be allowed to be used for Lync voice due to how easy ‘eves dropping’ can take place by mirroring the Bluetooth stack signal. My biggest shock though is the price?! At £129GBP it’s the almost the most expensive of all the speaker devices and in opinion not worth the price tag it comes with. The SP20 is the new device to the speaker market and in contrast looks very much a modern device, AND its= the only device out of the speaker range not to be made from plastic, which is refreshing. The shape is circular and made of composite metal. This device is the slimiest of the group but weighing in at around the same weight and the other speakers. It also comes complete with the neoprene case and has two cables for connection. One being a USB cable for Lync connectivity, and the second is for Aux connection to a mobile device. In the quick-fire tests the SP20 scored well with seamless connectivity and within seconds from the connection was able to make/take a lync call (No driver download). Equally on testing the secondary AUX wire on the quick test, simply plugging in the AUX cable into my iPhone made instant communication through the speaker. Excellent sound quality through the speaker and it scored the highest in the all tests including the loudness decibel test from 10ft. This being 91 decibels set at the max volume. One party trick the SP20 does have over its rivals is the ability to press the centre button for 5 seconds to active the ‘music’ mode on the speaker which in turn makes the speaker produce much richer tone and also more sound output (98 decibels). I’ve used my SP20 within my home office for listening to music while working and not once have I thought its was dull and poor quality. Like the sound quality using the speaker to talk through from 10ft away saw the highest decibel readings from all four tested devices and the reading was up at 67 decibels on average. 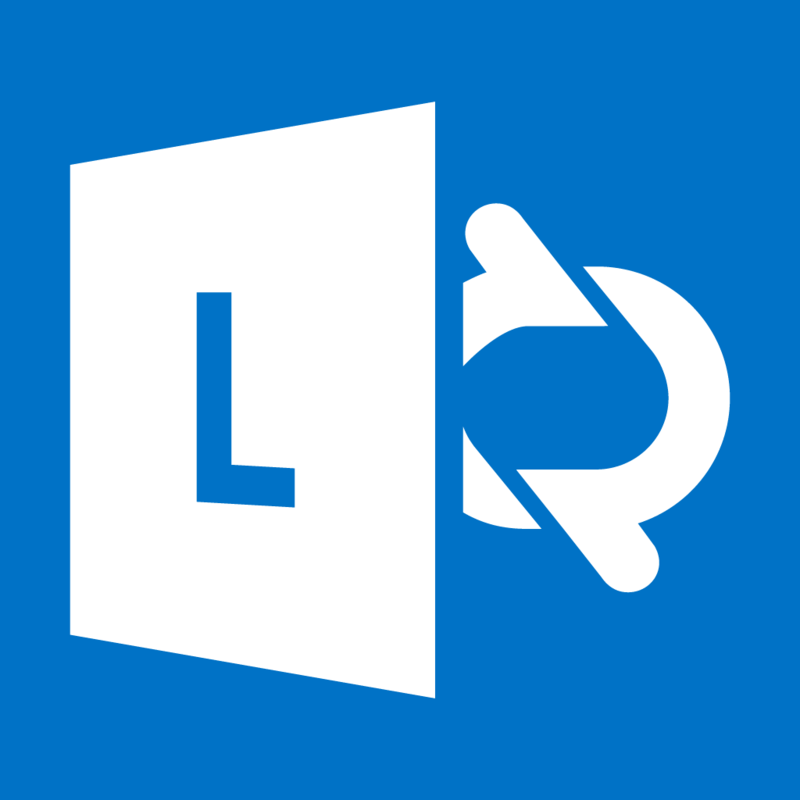 Another tech feature is the ability to have a conference call through Lync and also migrate ia call which you might aleady have on your mobile by plugging the mobile phone into the aux cable, from there you can bridge the mobile call into the Lync. This is a really nice feature and one which is a game changer, that all other devices can’t accomplish. Lets not forget the stereo sound boost button, and the SP20 is the only device out of the four which makes reference to being a music speaker as well. Battery charging of the SP20 is fast with 2 hours charging giving you 20 hours of Music Playing (don’t forget to use this with Lync you will be connected via the usb cable), meaning the only time you would use the battery is for music and mobile phone conferencing. That said I’m getting 18 hours of music playing from the device per charge. I love this device for the style alone, and its good to see someone break away from the mundane black plastic approach to devices. In my opinion on the style and look its worth the £99 price tag !! On a more serious note, the SP20 is a great device and along with the Jabra 510 will be something I will carry in my kit bag. Its also worth noting that with all Sennheiser Lync devices they are all tested and certified for ‘Lync for Mac’ as well. Finally a note to Sennheiser, if only you had included the Bluetooth option to the device the SP20, you would had been my first 5 star rating. So there we have it, the complete 4 device review. i think all the devices offers something to the UC market albeit, Device mobility, Sound quality, Connectivity features. But for me i would be simply looking at a good connection and good sound input and output as this is what you want from a speaker device right.? So to summarise and really recommend a device to use and also one i would recommend to customers i would have to go with the Sennhieser SPxx range. Although i do like the Jabra 510+ device i just don’t see it in the same light as the SP20 for build, battery life and ultimately the sound quality.